�One of the great black holes in Western opera, at least as far as the average opera fan goes, is the world of Spanish zarzuela. Usually comic and comparable to Gilbert and Sullivan operettas, zarzuelas last about an hour and -- back in the form's �golden age�, which lasted from about 1870 until the outbreak of the Spanish Civil War in 1936 - three to four would have been seen in the course of an evening. Recordings of zarzuela may be difficult to find outside of Spanish-speaking lands, but they are reasonably common and were so even in the historical, pre-Civil War period. 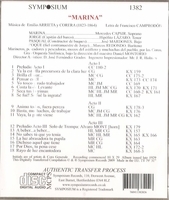 MARINA (1855) by Emilio Arrieta y Corera is one of the few zarzuelas preceding the Golden Age that remains in the active zarzuela repertoire, and it maintains a strong hold therein; it remains one of the most popular works of the Spanish theater. Musically, it is almost indistinguishable from Italian opera in the manner of Bellini or Donizetti, and it requires strong singers to carry the lead roles. This recording, made in 1929, followed a spectacular revival of the work at the Teatro Liceu in Barcelona. It has four of the great golden-age zarzuela singers who fortunately were captured in the electric 78rpm process."